REGISTRATION FOR THE 2019 SEASON IS OPEN. CLICK HERE TO SIGN UP TODAY! 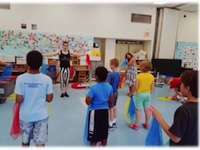 French for Fun Summer Camp is designed to teach young children (ages 4 to 12) French language skills in a fun environment. No prior knowledge of French is required! 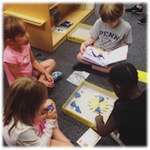 The 2019 French for Fun Camp season will last five weeks, starting on Monday, June 24 and ending Friday, July 26. 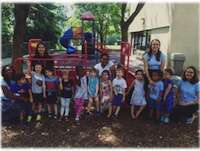 Each week is an independent session running from Monday through Friday, 9:00 a.m. through 3:00 p.m. Childcare is available before and after camp, from 8:30 a.m. to 9:00 a.m. and from 3:00 p.m. to 5:00 p.m. Camp is closed for the July 4th holiday. 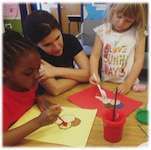 Children will learn French, immersed in a French-speaking environment, through games and fun activities. They will learn the same way they develop skills in their native language: by listening, watching, singing, playing, and expressing themselves. In the morning, your child will learn songs, listen to stories, play language games, role play, use French computer software, draw, play with puppets and complete fun activities that will increase his/her understanding and vocabulary in French. In the afternoon, your child will cook, prepare shows, do arts and crafts, make videos and go outside for sports and games, all in French to reinforce his/her communication skills. Every Wednesday, campers will go on a field trip to a venue related to the theme of the week. Every Friday, parents are invited to come to camp and see what the children have accomplished during the week.